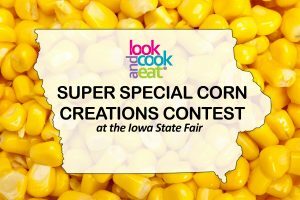 LCE is providing a special opportunity to Iowa residents with disabilities by sponsoring the “Special Corn Creations Contest.” This cooking competition encourages people 16 years of age or older who live in the state of Iowa to cook a recipe containing corn as an ingredient. Corn is one of Iowa’s great treasures, and we want to see it in YOUR favorite recipe that YOU cook yourself! There’s no restriction on the category of food — dishes can range from salads to soups, even desserts! Registered contestants will present their prepared dish at the Iowa State Fair for a chance to win generous prizes and, most importantly, have tons of fun. Let’s see what you’ve got, Iowa! Sign up TODAY! WHAT: A cooking contest for people with disabilities. Entries must contain corn, Iowa’s star ingredient! Contestants’ dishes will be judged on taste, creativity, and appearance. WHO: Open to anyone from Iowa that is 16 years of age or older who has a disability, either intellectual, physical, or both. Contestants may have assistance in any aspect of the contest process, but they should cook their creation as independently as possible. Look, Cook, and Eat will pay the entry fee ($5) for the first 100 contestants. Individuals MUST call 515.802.1961 or email statefair@lookcookandeat.com to register. Registration must be received by Monday, June 25, 2018. Late entries will need to register on their own at IowaStateFair.org no later than July 1, 2018, and will not qualify to have their registration covered by Look, Cook, and Eat. Contestants’ recipes do not need to be finalized at the time of registration. Contestants will need to provide their recipe typed on an 8 1/2 x 11-inch sheet of paper at the time of the competition. Look, Cook, and Eat will help with this process if desired and will be in contact with the contestants after their registration is completed. Contestants are responsible for purchasing their own ticket for entry to the State Fair if they would like to see the judging in person, which is encouraged! QUESTIONS? Don’t hesitate to reach out to us at statefair@lookcookandeat.com. Let’s get cooking, Iowa!